Consumer and commercial electronics may have hit a plateau where it would be impractical to make them smaller because their use will be more than cumbersome. But that’s not quelling the demand for more functions squeezed into whatever space is available—and those functions need to interface with the world outside the device. 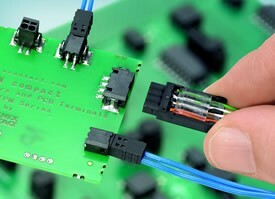 Connector makers are constantly addressing these demands with ever smaller products. Typically, existing interface types such as PCB-edge, USB, and HDMI are trimming down to squeeze into ultra-slim tablets and smart phones while leaving space for more interfaces. Molex has introduced its Mini50 unsealed wire-to-board connector system in a smaller package that saves 50% of the space that standard 0.64-mm connectors require(Fig. 1). Using smaller terminals, the system is viable for use with low-current electrical circuits found in unsealed automotive and commercial vehicle applications including lighting, radios, navigation systems, and HVAC systems. 1. The Molex Mini50 unsealed wire-to-board connectors take up half the space normally consumed by standard 0.64-mm connectors. The connectors enable lower overall harness weights by allowing users to crimp and process smaller wire gauges. Mini50 systems employ an independent secondary lock as part of the housing, and the printed-circuit board (PCB) headers come in vertical or right-angle orientations. Their high-temperature thermoplastic housing can withstand infrared and wave lead-free solder processing at a maximum temperature of 260°C. Current configurations include single-row, four-circuit, and eight-circuit versions and are available in multiple mechanical and visual polarization options. A dual-row, 12-circuit version is in the works for later this year. Also riding the miniaturization wave, Kycon adds the Micro HDMI connector to its line of HDMI components. Like the HDMI connectors residing in camcorders, mobile televisions, and notebook computers, the KMMDMIX-NS3-WS-BTRT micro connectors provide the same high-definition interface in a package half the size of a Type C (Mini) HDMI connector. The micro connector’s lower profile suits it for use in smart phones, handheld video-playback devices, and digital-video recorders. In contrast to the connector’s compact footprint, it exhibits the same mechanical strength and electrical characteristics as standard HDMI connectors. Weaving more USB functionality into portable devices, Global Connector Technology promotes an upside-down effect with its reverse-mount micro USB connectors. Tailored for top-mount PCB applications, the Reverse B type allows users to mount horizontal Micro USB connectors on the top side of a PCB with standard Micro USB connectors mounted on the underside of the PCB(Fig. 2). 2. Global Connector Technology takes the over-under position with its reverse-mount micro USB connectors. Take note that the top-mount connectors accept micro USB cable plugs in the correct orientation with the USB symbol facing upwards. To efficiently employ this design option, users must provide PCB cutouts that accommodate the space taken up by cable-mounted plug locking points mounted on the bottom of cable plugs. The company offers two options: USB3100 in pure surface-mount (SMT) and USB3135 with through-hole shell stakes for extra strength. Top PCB-mount micro USB connectors are available now for same-day sampling. Most of the current investment in connector innovation is in either improving or miniaturizing existing interfaces that have proved to be reliable, efficient, and popular. Interfaces become very popular with consumers if they work, are easy to use, and go light on the wallet. This trend is not slowing down and shows no signs of variation for the near future. Of course this excludes any proprietary and/or industrial and military offerings, which take up a slightly smaller portion of the connector-component market.